Sucre is the constitutional Capital of Bolivia (although the seat of the government is in La Paz) and probably the country’s prettiest town. 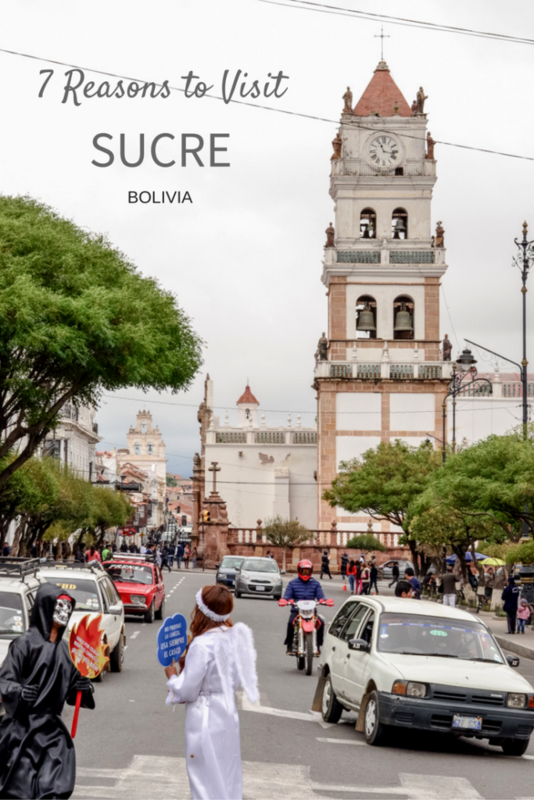 If you want to know what makes this place so special and why you should visit Sucre while traveling to Bolivia, this post is for you! It all started even before first humans arrived! In the environment of Sucre, there are more than 5,000 well-preserved footprints of dinosaurs, and you can see some of them on a giant wall or in the Parque Cretácico just a few kilometers from the city. And now let’s get back to the history of the city as such. Charcas, which was the original name of the town, was founded in 1538 by the Spaniards. Sucre, its current name, was established in the first half of the 19th century in honor of Antoni José de Sucre, a fighter for independence. Yes, it was here where the independence of the country was declared in 1825 in Casa de la Libertad. 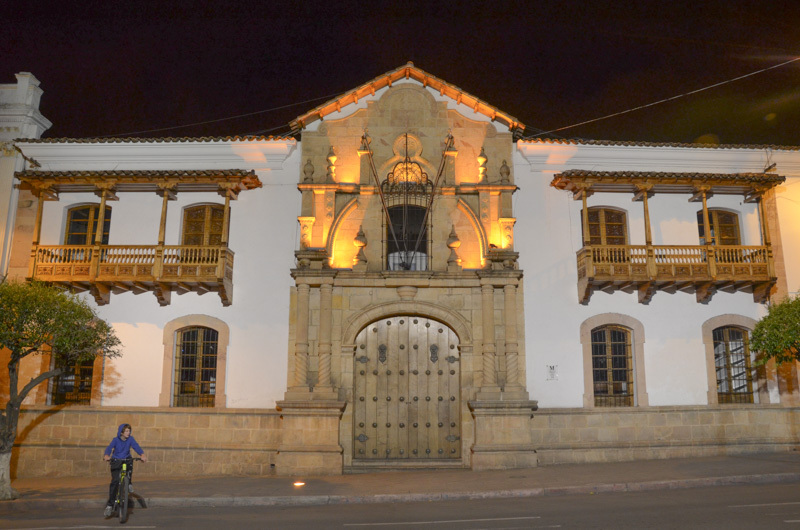 This building is considered as the most important historic monument of Bolivia and hosts also a museum about the Bolivian history. Sucre lies in the center South of Bolivia, in about 2790 m above the sea level. The climate here is more pleasant and stable, compared to the cold Antiplano or warm East. The weather here is spring alike most of the year, quite often sunny with deep blue sky, with just a few rainy days and thunderstorms in the wet season. Unfortunately, when we were there, the sky did not show up behind the clouds. 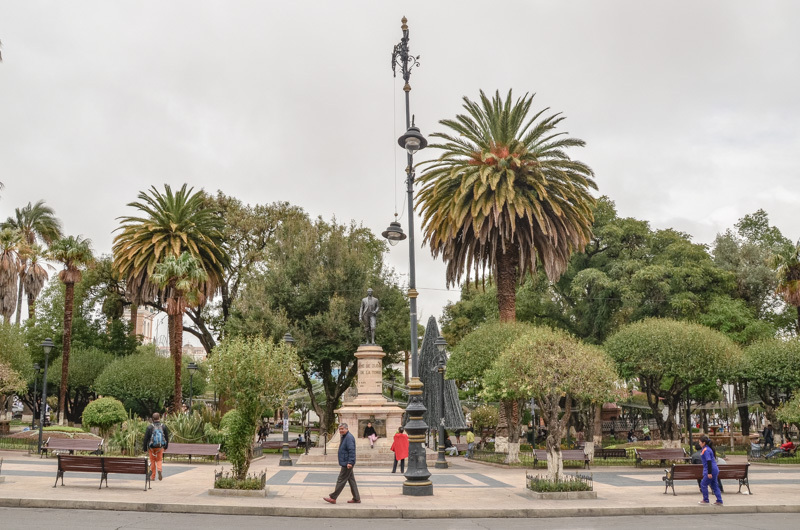 As it is a very relaxed city with beautiful historical center and parks, you will really enjoy the nice weather while strolling down the town. Listed as a UNESCO site since 1991, Sucre is not only the country’s most beautiful city but also a baroque jewel of the South America that still have well-preserved Spanish architecture and beautiful religious buildings. Many of them are of white color thanks to which it is also known as ‘La Ciudad Blanca’ (White Town). 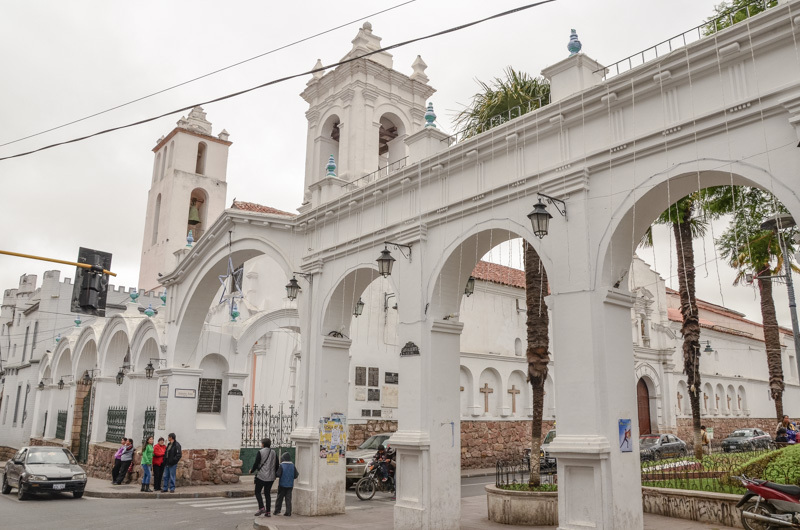 Some of the most beautiful buildings you need to check out are the colonial buildings around Plaza 25 Mayo, Oratorio de San Filipe Neri, Iglesia San Francisco, or La Recoleta. Food in Sucre is delicious. Whether you go eat out or you grab a snack on the street, you will love this place! For me, my food experience was the best in Sucre out of the whole country. 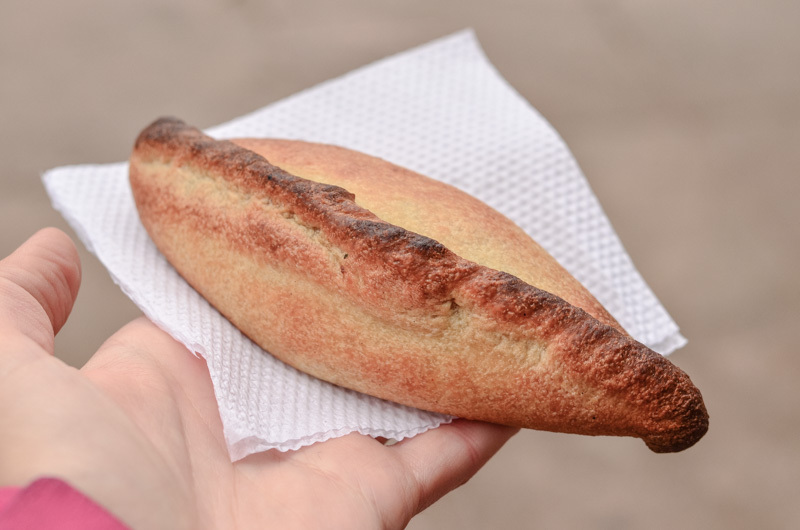 You need to try the local salteñas, that are similar to empanadas. Somebody told us that salteñas are to be eaten during the morning hours with fresh fruit juice. A nice place to grab a snack on the go and to observe daily life is Mercado Central. But there are also many good restaurants and pleasant coffee places. Besides food, Sucre has been referred to as the Capital of the Chocolat as well – try the boutique Chocolate Para Ti, the best one in town. We loved to wander in the Simon Bolívar Park where you find a small Eiffel tower and many young couples wandering hand in hand, or just sit and relax under pine and palm trees on Plaza 25 Mayo, the heart of the city which is probably the greenest plaza I have ever seen – you have the impression as you would be you are in a small park. People come to meet here, to relax, or just to be seen, but also to relax under the pine and palm trees. 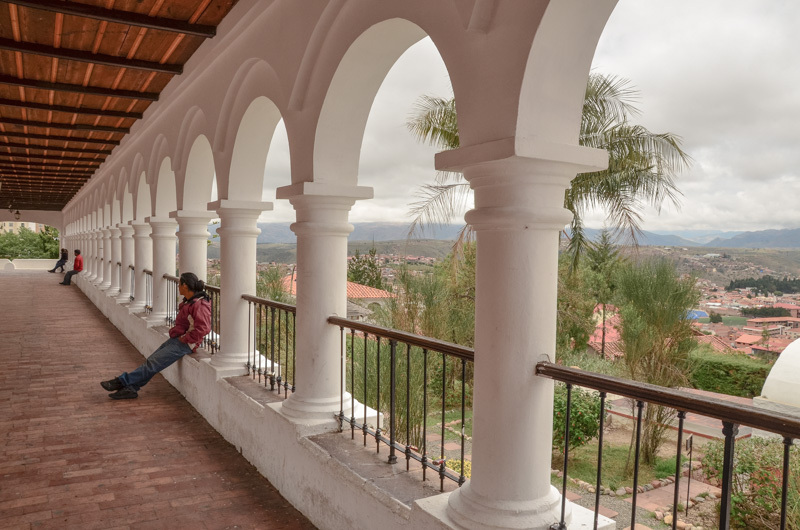 Few steps from the Convento y la Iglesia de la Recoleta, a Franciscan Church founded in 1600 on the Cerro Churuquella hill, you will find a mirador offering probably the most beautiful panorama of Sucre. Just below the arcades of mirador, there is a café Gourmet Mirador which is an ideal place to enjoy the view while sitting on their garden terrace and sip a delicious smoothie. Sucre is much smaller than La Paz, but on the other hand, it feels very cozy. 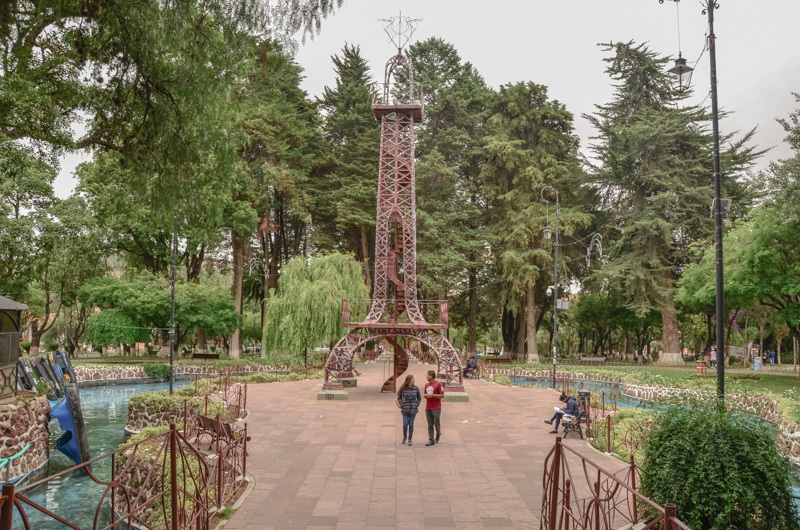 It is also less traditional than other Bolivian cities, as the original inhabitants, the Indigenous people, have been pushed out of the city center. 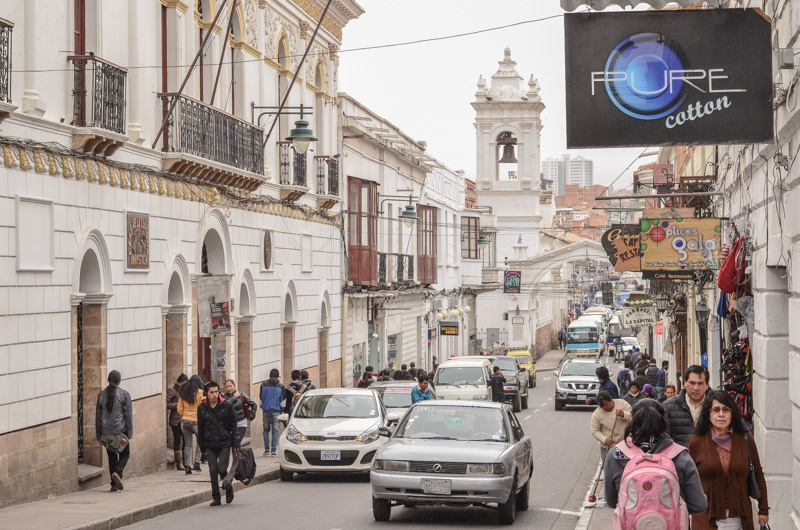 But in any case, Sucre will make you experience Bolivia in another light! Have you ever been to Sucre? What did you like about it? Is there something you did not enjoy? Let me know in the below comments!